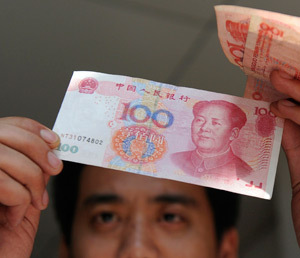 Multinationals are positioning themselves to capture lucrative gains from the internationalization of China’s currency. When McDonald’s became the first non-Chinese corporation that was allowed to issue a bond denominated in yuan in Hong Kong in August 2010, the American fast-food giant’s modest goal was to raise 200 million yuan ($31 million) to build new drive-through restaurants and “re-image” old sit-down restaurants in mainland China. “We try to borrow in local currencies as part of our overall currency hedging strategy,” says McDonald’s spokeswoman Lizzie Roscoe. The strategy is particularly important in China, where the corporation directly owned all of its 1,187 burger-flipping eateries at the end of last year—unlike in the US, where most McDonald’s stores are franchises—and plans to build nearly 200 new ones this year. The Oak Brook, Illinois–based company’s groundbreaking “dim sum” bond issue marked the start of an unstoppable trend that had been made possible by a new trade settlement scheme that the People’s Bank of China, the country’s central bank, had initiated in July 2009. In short order, three other multinational corporations—Caterpillar, Unilever and Volkswagen—issued a total of 2.8 billion yuan ($427 million) in yuan-denominated bonds between November 2010 and June this year. And they may soon have company. Earlier this year a survey by Deutsche Bank of 44 multinationals that do business on the mainland found that two-thirds of them were considering issuing such bonds because their cost of funds would average only 2.6%—nearly four percentage points less than their average 6.3% funding cost for a two-year renminbi loan from an onshore bank. The ability to issue these dim sum bonds, humorously named after the Cantonese lunchtime specialty, is just one example of the profound impact that a policy by the People’s Bank of China to internationalize the renminbi is having on the way multinational corporations do business in China. The policy is the most recent of many instances of Beijing’s exerting its political and economic influence worldwide, from its large investments in mining and energy in Africa over recent years to its emergence as the buyer of last resort in Europe’s sovereign debt crisis in June. It’s even cropping up in China’s bilateral relations—as it did in a trade agreement with Russia last November in which both countries agreed to denominate their trade entirely in rubles and yuan without going through the dollar. Because the policy is part of a larger effort by Beijing to fight real inflation in the world’s second largest and fastest-growing economy, it could be a boon to the global economy if it succeeds—or a damper on global growth if it falters. Don’t look for praise for the policy from corporate treasurers or bankers in the US, however. “If the dollar were to lose its privileged status as leading international currency, it is likely that this would be associated with a decreased willingness among international investors to hold US assets,” says Jeffrey Frankel, an economics professor at Harvard University who has served on the White House’s Council of Economic Advisers and written a book on the rise of the Japanese yen. “Given the US’s dependence on foreign borrowing, there could at some point be a ‘hard landing’ for the dollar: an abrupt depreciation accompanied by sharply higher interest rates and a fall in US securities.” The few steps that Beijing has taken thus far could give rise to new forms of trade and investment that are not to be underestimated. The settlement scheme allows a long list of “approved” mainland Chinese companies to send invoices to their trade counterparties—many of which are multinational cor porations—in renminbi as opposed to a reserve currency such as the dollar, euro or yen. 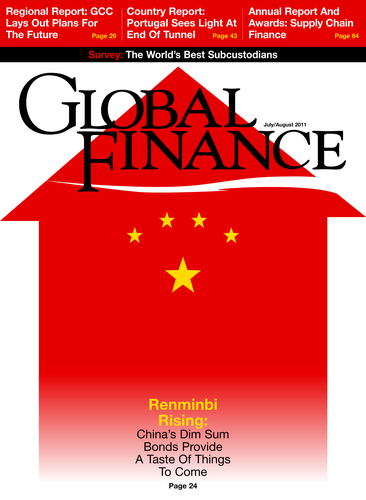 In Hong Kong, a global financial center that Beijing has treated as an offshore market ever since taking control of the former British colony in 1997, foreign companies are being given more options to hedge their renminbi currency risk, which could make it easier to accumulate the renminbi these corporations will need to pay those invoices. These developments are being made possible by numerous, still-incomplete relaxations of currency controls that have been rolling out for the past two years. According to an announcement by the Hong Kong Monetary Authority (HKMA) on June 13, further liberalization will take place later this year. Because these rule changes allow the multinationals to lower their cost of funds, they would be leaving money on the table if they did not take advantage of them. As a result, 15% to 20% of China’s international trade is expected to be denominated in yuan by 2015, compared with just 8.7% currently, according to Standard Chartered Bank in Hong Kong. That trend will continue if China follows in the footsteps of Japan, which had about 40% of its exports denominated in yen in the first half of 2010. The agenda behind the settlement scheme of July 2009 was to protect the Chinese economy from real inflation, which is being caused partly by the weakness of the US dollar since the global financial crisis of 2008 and by the US Federal Reserve’s quantitative easing policy. These developments have inflated commodities prices over the past couple of years. To combat these forces of inflation, China wants its companies to be able to price their exports in renminbi and to price the commodities they import, such as base metals and oil, in the national currency as well. Currently, China’s exports and imports are priced mainly in US dollars. Yet the increased use of renminbi, along with perpetually rising demand for Chinese exports, can only cause the renminbi to appreciate in the years to come, according to several bankers at HSBC, Standard Chartered and Keefe, Bruyette & Woods in Hong Kong. That’s why investors in Asia and Europe are putting their money into brand-new dim sum bond funds that are managed by firms such as Barclays Capital, which launched the Renminbi Bond Fund in Singapore in April this year under the UCITS III investment rules of the EU. In June the fund had 52 million yuan in assets, which Paul Hopkins, Singapore-based head of Barclays capital fund solutions for Asia, predicts will eventually rise to hundreds of millions of renminbi. “We are seeing a large interest across the region—in fact it’s quite global now,” says Hopkins. “Everyone wants to be part of the story around expected renminbi appreciation.” By issuing these bonds in Hong Kong, where there is an oversupply of yuan-denominated bank deposits, the multinationals are benefiting from relatively low interest rates. These deposits are accumulating so fast that Deutsche Bank estimates they will grow 10-fold, to 750 billion renminbi, by the end of 2012. One reason is that the Peoples Bank of China still treats these “offshore” deposits as foreign capital—and enforces rules that make it difficult to “repatriate” them to the mainland without prior approval. The PBOC is concerned that if all that renminbi were repatriated at once, it would push down interest rates on the mainland, which would be hard to justify while the central bank is fighting inflation. Some bankers expect the repatriation process to be streamlined for foreign investors, such as the issuers of dim sum bonds, later this year under the rule changes that the HKMA referred to on June 13. On the mainland it’s getting easier for Chinese companies to get paid in the national currency. In December last year the government announced that 67,000 companies scattered across mainland China were permitted to export goods and send invoices denominated in renminbi to their trade counterparties. The settlement scheme has grown from five pilot cities on the mainland in July 2009 to 20 provinces that cover about 90% of China’s land area today. For a trade counterparty to a Chinese company, the main motive to deal directly in renminbi is usually to reduce the cost of currency hedging, says Ilan Goldfajn, chief economist at Itaú Unibanco in São Paulo, Brazil. Importers of Chinese-made products have been paying for those goods with dollars, euros or another settlement currency, regardless of what their home currencies are. As a result, many companies around the world are currently paying hedging costs for two foreign currencies—the settlement currency and the renminbi. This has been less of an issue for companies in the US, the eurozone or Japan, whose home currencies happen to be global settlement currencies, which leads Goldfajn to believe that companies in other countries, such as Brazil or Korea, will be among the first to embrace the opportunity to settle invoices directly in renminbi. "Given the US’s dependence on foreign borrowing, there could … be a ‘hard landing’ for the dollar." 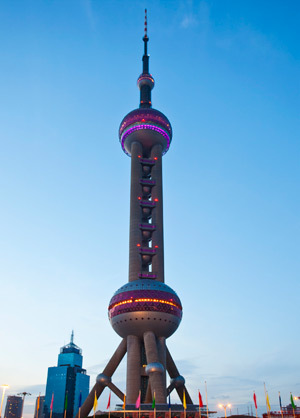 Demand for renminbi hedging products is expected to rise as the PBOC’s policy to internationalize the currency begins to emerge as one of several factors that are now causing the renminbi to appreciate, says Daswani. Fortunately, it is getting easier to hedge against the currency risk of holding offshore renminbi, which investors are allowed to hold in banks in Hong Kong. 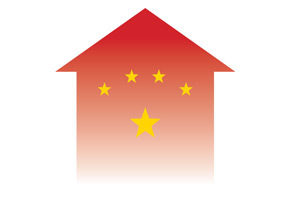 In August 2010, the HKMA began operating a market in deliverable forward renminbi contracts, in which you exchange the notional at maturity and take delivery of the underlying instrument. Previously, there had been a market only in nondeliverable forward renminbi contracts, in which you only exchange the percentage that you made on the notional amount. 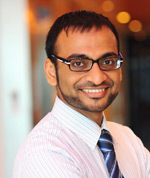 “The upshot for corporates is that they now have two markets in which they can transact. And sometimes when there is a better rate available in one market versus the other, then they can exploit that differential,” says Mirza Baig, Asian currency strategist at Deutsche Bank in Singapore. When it was launched two years ago, the settlement scheme was not depicted explicitly as a move to position the renminbi as a global settlement currency, but some senior international bankers believe that was Beijing’s ultimate goal. And the dim sum bonds are “a step in that direction,” says Frankel. To be sure, much remains to be done, such as the gradual removal of controls that keep the renminbi pegged within a narrow band to the dollar and that, some bankers say, will eventually become obsolete as the currency gains wider acceptance. Once such steps are taken, Daswani and Goldfajn say, the renminbi could easily be accepted as a settlement currency by corporations on every continent. With the current rate of change, it would not be a shock to see that happen well before the end of the decade. Apart from a select few multinationals that have issued dim sum bonds, the vast majority of companies outside China have never had to contemplate dealing in yuan. Yet that is about to change as tens of thousands of Chinese importers and exporters prepare to take advantage of new regulations—and inundate all five continents with invoices and payments denominated in their national currency. But it would be foolish for any corporate treasurer to wait for such an invoice before taking the steps required to deal with the first one that arrives in the mailroom. Here is a checklist of indispensable steps to take immediately. When picking an exporter on the mainland, It’s not enough just to make sure they are on the list of 67,000 “mainland designated enterprises” that have received regulatory approval to export their goods and send an invoice denominated in yuan. The problem is that some of these companies are still in the process of obtaining approval from several different authorities, which takes about six months. “The entity you are dealing with who says, ‘I am a mainland designated enterprise’ could be at various stages of approval,” warns Neil Daswani, head of transaction banking for Northeast Asia at Standard Chartered Bank in Hong Kong. Such a misunderstanding could delay any deal. It’s much easier to pick an importer on the mainland. At just one window of clearance, a Chinese company can enroll itself as a legitimate enterprise. Then it can pay directly in yuan for imported goods. The settlement scheme of July 2009 offers two options: dealing with an agent bank on the mainland or dealing with an “offshore” bank in Hong Kong. The latter is the preferred choice for multinationals that have subsidiaries in Hong Kong that are already engaged in two-way trade with counterparties on the mainland. It’s also essential for companies that are issuing dim sum bonds and repatriating the proceeds to the mainland. Because the renminbi is expected to appreciate in the near term, bankers advise hedging against that risk immediately after getting paid in that currency. There are two hedging options to choose from in Hong Kong, nondeliverable forward contracts and deliverable forward contracts. The former is merely a futures contract with no physical settlement of currencies at maturity, and the market in such contracts is not regulated by Chinese authorities. The latter involves actually taking delivery of the underlying currency, is regulated thanks to recent rule changes, and is regarded as somewhat safer. All of the procedural aspects of adopting the yuan, says HSBC’s Chan, are “the easy part.” The hard part, he explains, will be to alter the corporate culture of the multinationals to make it easier for them to trade directly in yuan. The commitment involved in this process is not to be underestimated. Corporations are now hiring banks and management consultants to shepherd them through the transition, giving rise to a whole new genre in financial services worldwide.